We Sell, Install, and Repair Anything Related to Security. USA Locks, LLC® offers friendly service with a smile to anyone who needs a key copied, a question answered or professional advice. We provide our customers with solutions that meet their unique requirements. We utilize quality products, proficient implementation and detailed craftsmanship to ensure complete customer satisfaction. We are constantly updating our procedures to keep up with ever-changing technology. 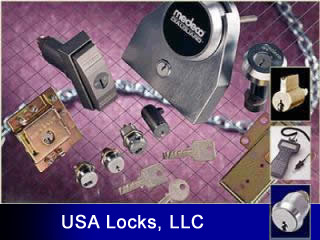 USA Locks, LLC® has been protecting people and their property from unfortunate incidents for over 36 years. We pride ourselves on being a mobile company where customer service means timeliness, quality work and a friendly attitude. The professionals at USA Locks, LLC® are licensed, bonded, certified and insured to ensure you get honest, intelligent and courteous service. Our experience enables us to tackle any job no matter how difficult it may seem. Whether you need something as simple as a key or something a bit more complicated, we are here to help you. Our four brand new commercial vans are equipped with computers and credit card machines for your convenience.